This gorgeous set of A6 size Foil Milestone cards comes in a set of 34. An index card is added as a .. This gorgeous set of A6 size Foil Milestone cards comes in a set of 16. Featuring a vibrant polka do.. 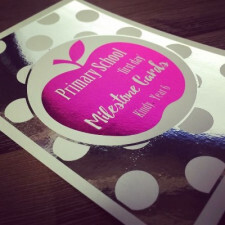 This gorgeous set of A6 size Foil Milestone cards comes in a set of 16. Featuring a vibrant backgrou.. This gorgeous set of A6 size Foil Milestone cards comes in a set of 8. From Kindy through to Year ..